Did you know that celery seed could help keep your blood flowing in a healthy manner? Good circulation is important to good health. Your blood delivers both oxygen and nourishment all over your body. So it's easy to see why you're smart to think about cardiovascular health. Celery Seed Extract from Natural Factors contains a special compound found only in celery that could support healthy blood pressure already within a normal range. It's called 85% 3-n-butylphthalide, or 3nB for short. Celery seed seems to help regulate water retention in the body. That means it may reduce swelling, which is beneficial to blood pressure and joint health. Celery seed contains omega 6 fatty acids and flavonoids, including a substance called apigenin, which may have unique free-radical fighting properties. 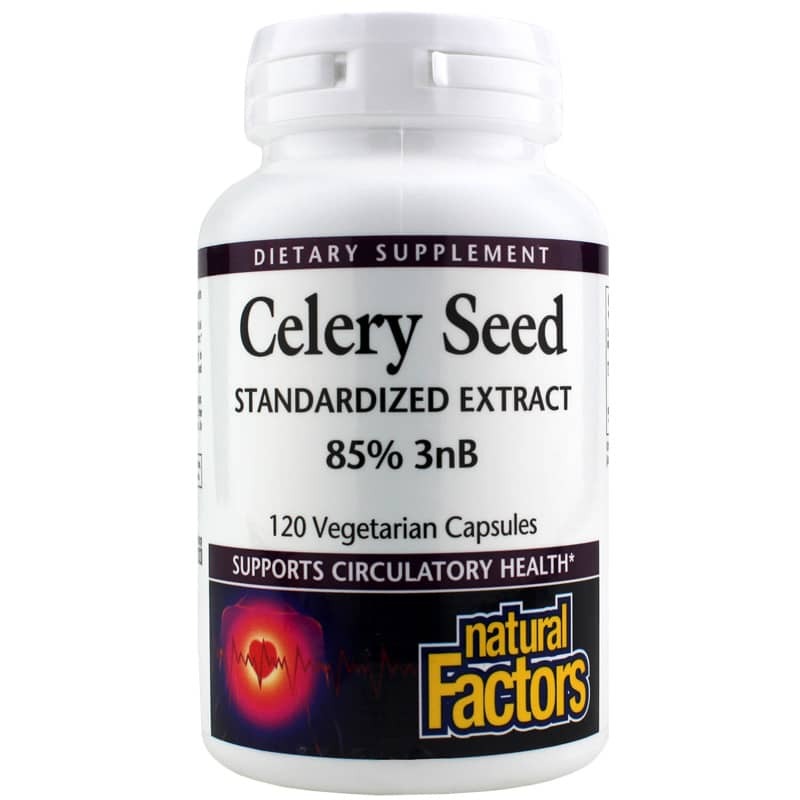 Just one capsule of Natural Factors' Celery Seed supplement is like eating as many as six ribs of celery. And you'll do it without the unwanted effects of buffalo wings and blue cheese dipping sauce. Get your own Celery Seed Extract from Natural Factors and harness the health benefits for yourself! Other Ingredients: rice powder, vegetarian capsule (carbohydrate gum (cellulose), purified water), magnesium stearate (vegetable grade). Contains NO: dairy, sugar, wheat, gluten, yeast, soy, corn, egg, fish, shellfish, animal products, salt, tree nuts, GMOs, artificial colors, preservatives, or sweeteners. 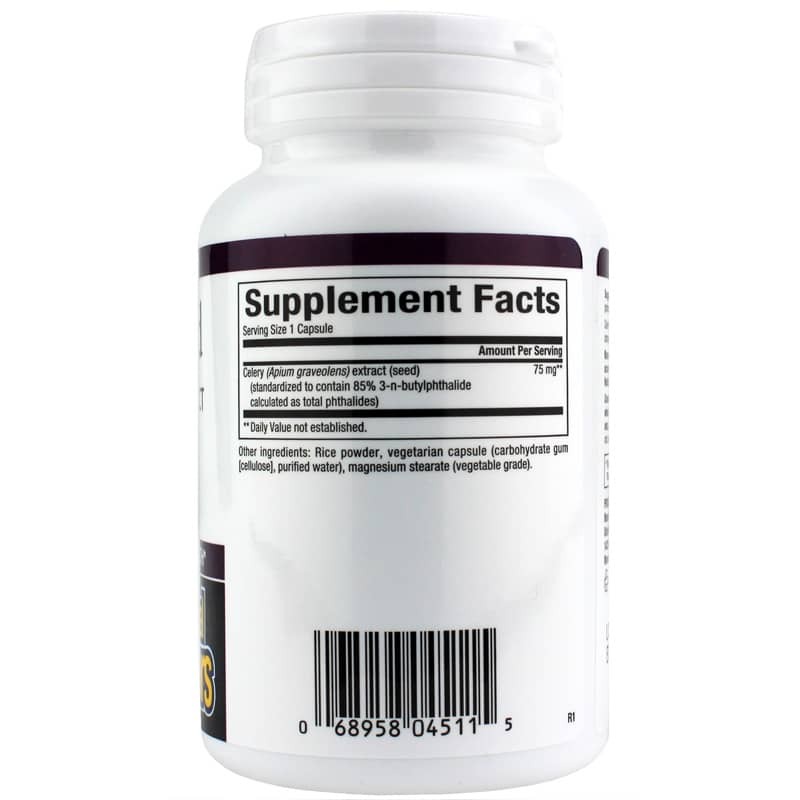 Adults: 1 capsule, 2 times per day or as recommended by a healthcare professional. Way too expensive for content! They would sell a lot more if they were not so greedy regarding their profit per item!!!!!!! My feet and nkles were swollen for years. It is not completely gone yet but is a lot better. I can get my shoes on with few problems now. I will continue to use this supplement. I have been using the celery seed extract for about 3 weeks and so has a friend of mine. I am a diabetic and I have notice a drop in my sugar level readings; I have notice less pain in my knee and overall I am able to get out and walk with much less pain. 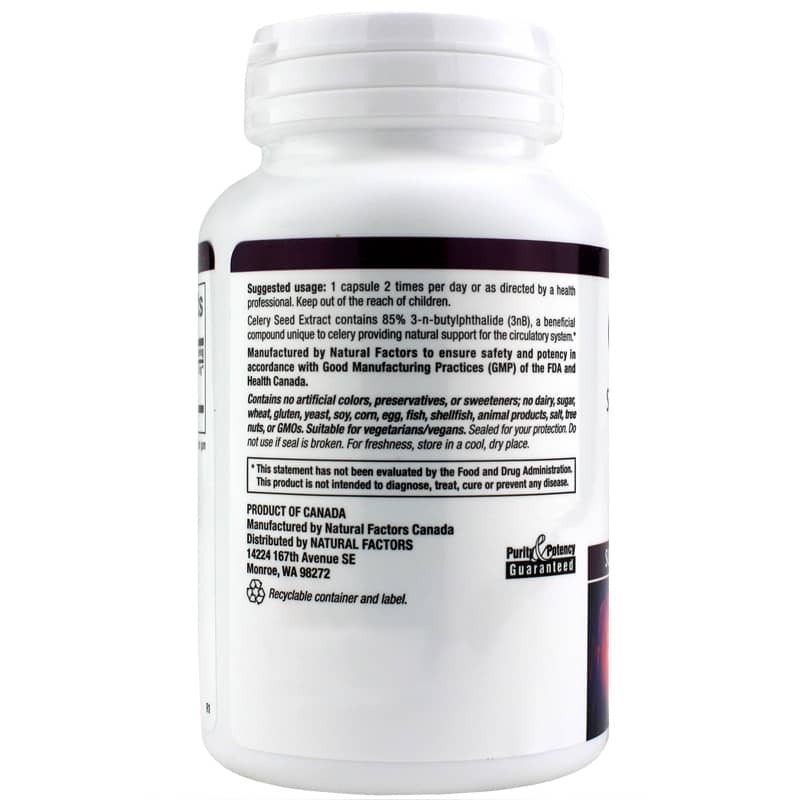 I think this is due to my taking this supplement and would recommend it to others. I have been taking the celery seed extract for several weeks and can already tell some improvements. My numbers are much bettere and it helps the old joints. The product is great and I would recommend it to others. Celery Seed Extract has corrected issue and now can eat pork and seafood. Wonderful product. Allow 30 days for results.